Thanks for using Noko! We're sorry to see you go and hope to see you again one day. And don't worry, we don't make you call a phone number like some other services do. If there's something that just wasn't right for you or that we could do better, please let us know so we can improve Noko! Important: canceling your account will immediately and irrevocably sign out everyone in your account and delete all your data from our servers. All shared invoices and reports will immediately stop working. There's no undo. 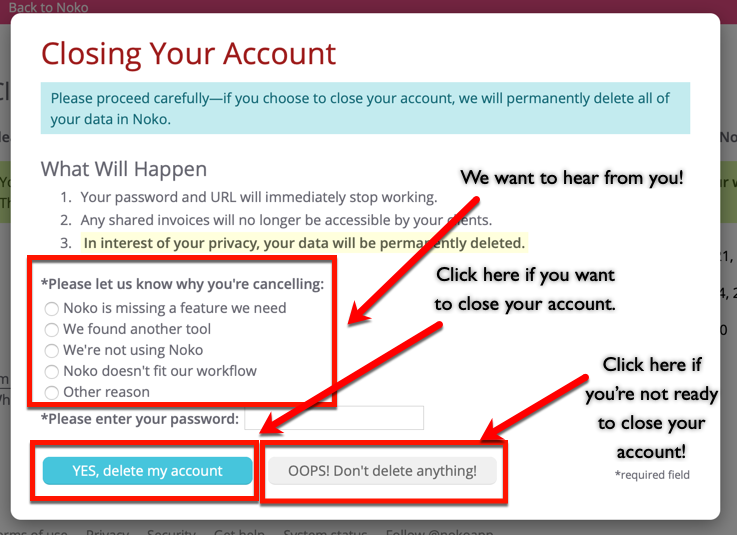 Log in to your Noko account as the Account Owner. Click on Close Account in the green navigation sidebar. Click the I'm sure, close my account link. You can confirm or cancel in the next step. Take 10 seconds and let us know why you're closing your account. We're a small business and depend on feedback to improve our product! Perhaps we'll have that feature you always wanted in the future (we'll make sure to let you know when we do!). Thank you for your honest feedback! Enter your password. This protects your account from being deleted by anyone not knowing the account owner password. Click Yes, close my account and delete my data to delete your account. All your data will instantly be deleted, signing in will no longer be possible and any links shared with others (like invoices and shared reports) won't work anymore. Make sure to communicate with your team that you no longer use Noko (we are not sending out emails to the members of you account). Please note that account cancellation is immediate, your data will be deleted from our servers and all links to your account will cease to work (this includes invoices and reports shared with customers).